↑ 1.0 1.1 1.2 Jonas, Gerald (September 3, 2013). 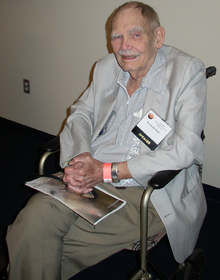 "Frederik Pohl, Worldly-Wise Master of Science Fiction, Dies at 93". New York Times. Retrieved September 3, 2013. ↑ ""Farewell," "The Way the Future Blogs"". Thewaythefutureblogs.com. 2013-09-02. Retrieved 2013-09-02. ↑ "Let There Be Fandom, Part 3: A Brooklyn Boyhood". Thewaythefutureblogs.com. 2009-10-02. Retrieved 2012-09-08. ↑ "The Way the Future Blogs, an online memoir by science fiction writer Frederik Pohl » Blog Archive » My Life as Book Editor for Popular Science". Thewaythefutureblogs.com. 2011-07-28. Retrieved 2012-09-08. This page was last changed on 2 November 2017, at 13:50.